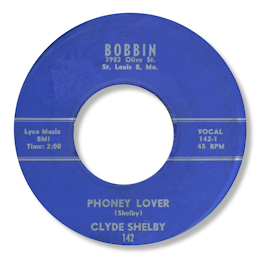 The Bobbin label from St Louis is best known in soul circles for kick starting the careers of people like Fontella Bass, Little Milton and Albert King. But sadly this 45 from Clyde Shelby didn’t perform the same trick for him. Perhaps the fact that it was the second to last release on the label might have had something to do with it, as Bobbin was clearly running out of steam by 1962. But both sides are worth hearing – “How Could You Ever Lose” is a lively jumping R & B side that might interest an enterprising DJ and the top side Phoney Lover is of great interest to me. It is a really good blues ballad which once again shows just how strong Bobby Bland’s influence was around this time. Pity the horns are so low in the mix. File under “Blandalikes”. Thanks as always to Davie Gordon for the correct date info.